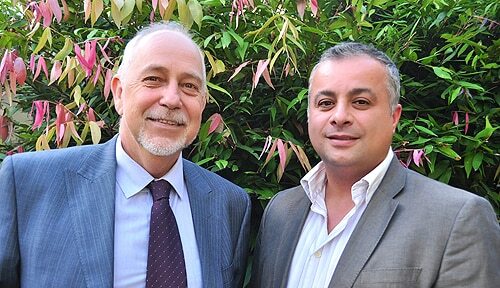 (L-R) Dr Alex Blaszczynski and Dr Fadi Anjoul from the Gambling Treatment Clinic. Many people talk of problem gambling as an 'addiction' but work coming out of the University of Sydney's Gambling Treatment Clinic suggests that this may not be the case. "The idea of gambling addiction is widespread, but inaccurate," says the clinic's Education and Training Officer, Dr Fadi Anjoul, who has treated problem gamblers for the past 15 years. As Responsible Gambling Awareness Week (14 to 20 May, 2012) begins, thoughts turn to the best ways of helping problem gamblers. Dr Anjoul notes that problem gambling has been consistently grouped with drug and alcohol addiction, but notes symptoms such as tolerance or withdrawal, which are central features of addiction, are rarely seen in gamblers. "Problem gambling is better thought of as a misguided obsession," Dr Anjoul states, "which means we are dealing with habitual and poorly informed choices rather than biological processes that are beyond individual control." The difference has important implications for treatment. Poorly informed choices and behaviours can be treated with what is known as cognitive therapy, which helps people understand the story of their gambling, of how they ended up where they are, and to change how they think about their involvement with gambling. Dr Anjoul has developed an innovative brand of cognitive therapy that generally results in much better outcomes than traditional therapies based on the disease or addiction model of gambling. "Traditional therapies tend to focus on ways to help people deal with their urges when they occur," notes Dr Anjoul, "and show high rates of relapse after therapy ends. However, with the model we are working with, we often find that by the end of treatment, people are experiencing very few urges." "The results we are getting so far at the Gambling Treatment Clinic with the new cognitive therapy are extremely exciting," states Professor Alex Blaszczynski, Head of the University's School of Psychology and a world-renowned expert on problem gambling, who hopes to assist Dr Anjoul with promoting training based on this new treatment. "It is early days but at this point it appears we are seeing better treatment outcomes and much lower relapse rates than have been found elsewhere." The Gambling Treatment Clinic, which is funded through the NSW Government Responsible Gambling Fund, has locations at Parramatta, Lidcombe, Campbelltown, as well as at the University of Sydney's Camperdown Campus.